Japan celebrates the New Year on January 1st (not some time in late January like the Chinese). More accurately put, Japan celebrates the New Year from January 1st to the 3rd. The holiday always includes a visit to a Buddhist temple or Shinto shrine (actually, most people hit both… nothing wrong with hedging your bets). And wherever large crowds of Japanese congregate, good food is never far way. 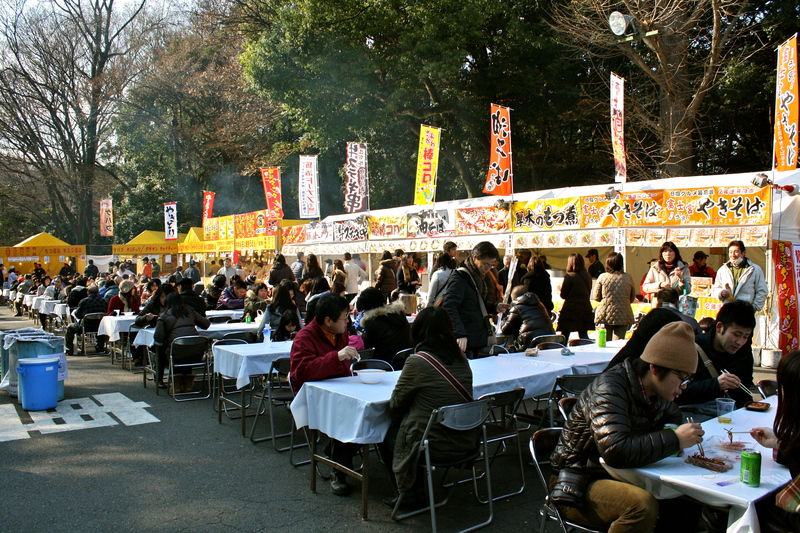 During major Japanese holidays like New Year’s the streets surrounding the largest temples and shrines are filled with vendors whipping up popular street food like yakisoba (fried noodles), karaage (fried chicken), okonomiyaki (vegetable and seafood pancakes), yakitori (grilled chicken), takoyaki (doughy balls filled with octopus), chocolate covered bananas, and numerous other treats. All these delicious morsels, accompanied with the free flowing sweetened hot sake and cold Japanese beer, make for an atmosphere that’s always festive and celebratory. I love spending New Years in Japan. From the photos below it shouldn’t be hard to see why. 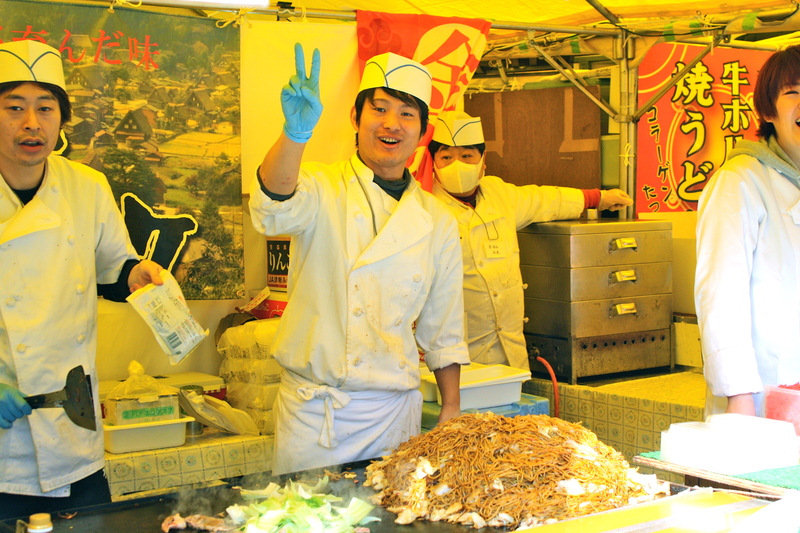 Just a small portion of the vendors selling food at the famous Meiji Shrine. Yakisoba: noodles fried with pork, vegetables and a thick, slightly sweet sauce similar to worcestershire. Often served with bright red pickled ginger. 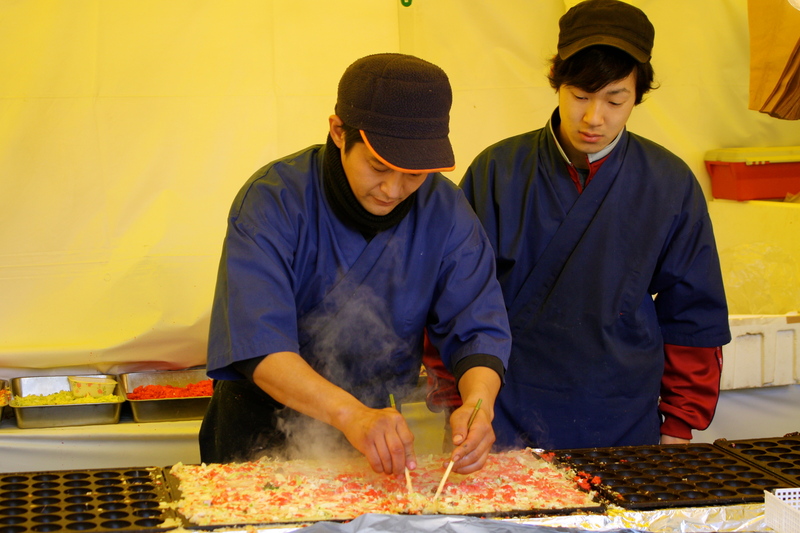 The master teaching a young pupil how to expertly flip the takoyaki balls using two chopsticks in a pick like fashion. It’s unfortunate that I didn’t have a video camera on me, I’ve never seen it done so quickly and yet so effortlessly . The finished product. 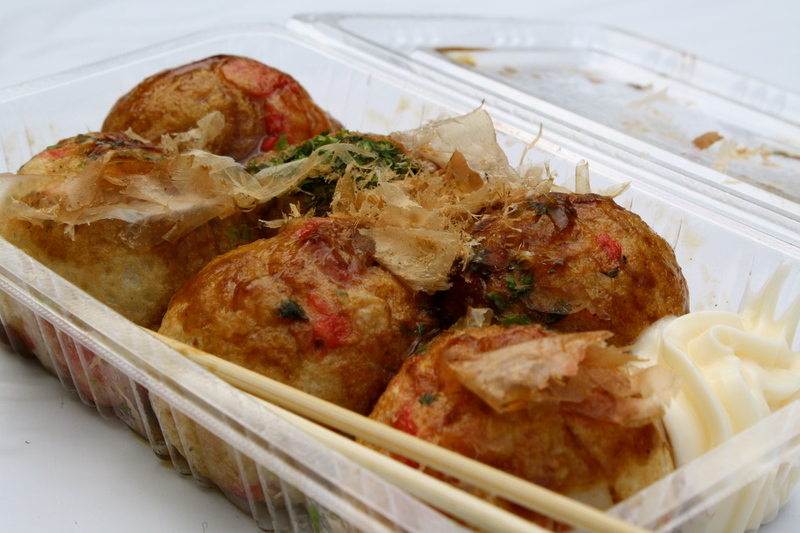 Takoyaki (tako-octopus, yaki-fried/grilled): soft spongey batter filled with chunks of octopus, pickled ginger, and a spattering of minced vegetables. Topped with a sweet/savory sauce, Japanese mayonnaise, bonito flakes and a dusting of seaweed. 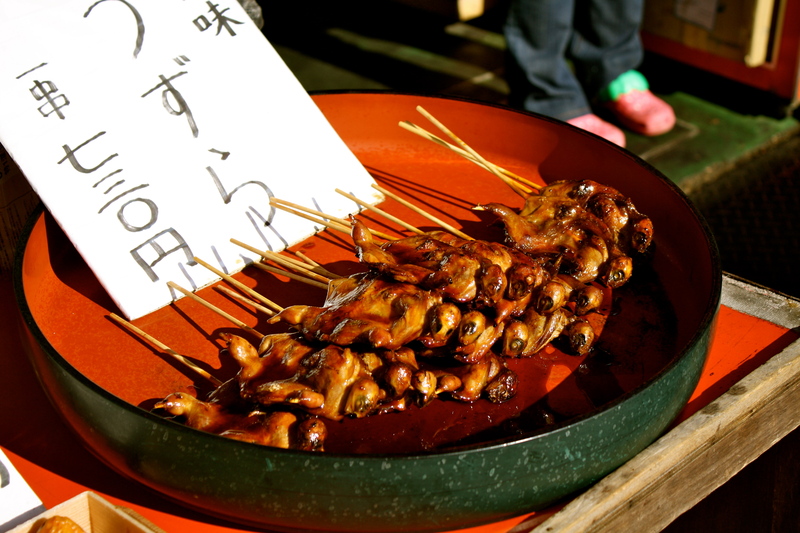 Takitori: chicken bits grilled with a sweet soy glaze. 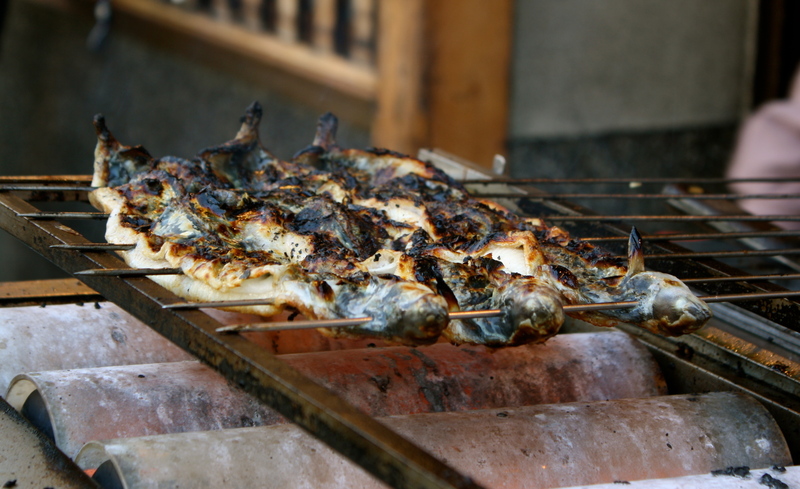 Whole fish, salted and grilled over hot coals. 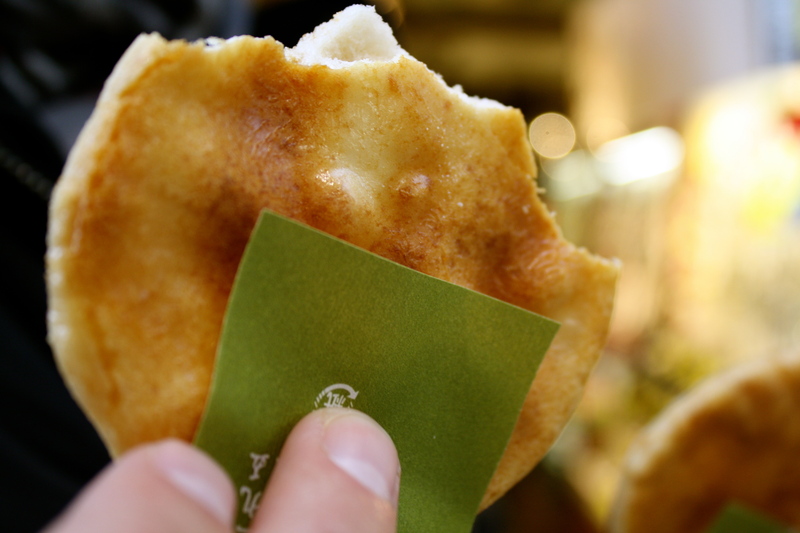 Leading towards the popular Senso-ji Buddhist temple in Akasaka is senbei alley, a street devoted to the creation and selling of senbei, Japanese rice crackers. 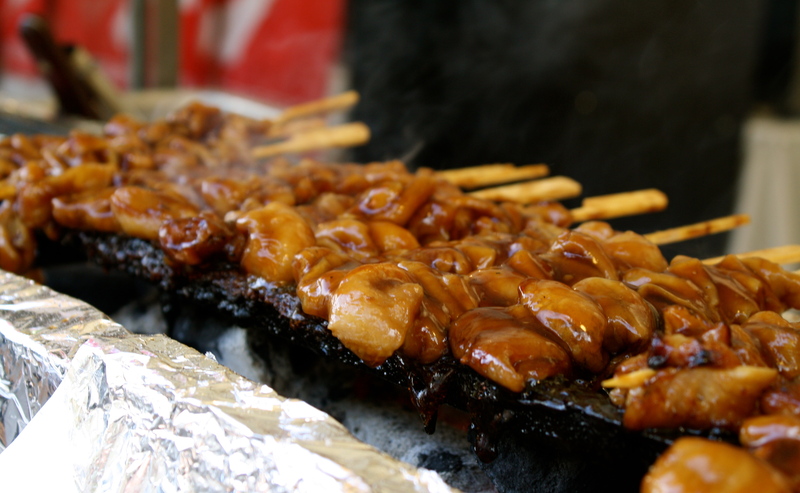 In one store a weathered ol’ pro toasts the crispy treats over hot coals. 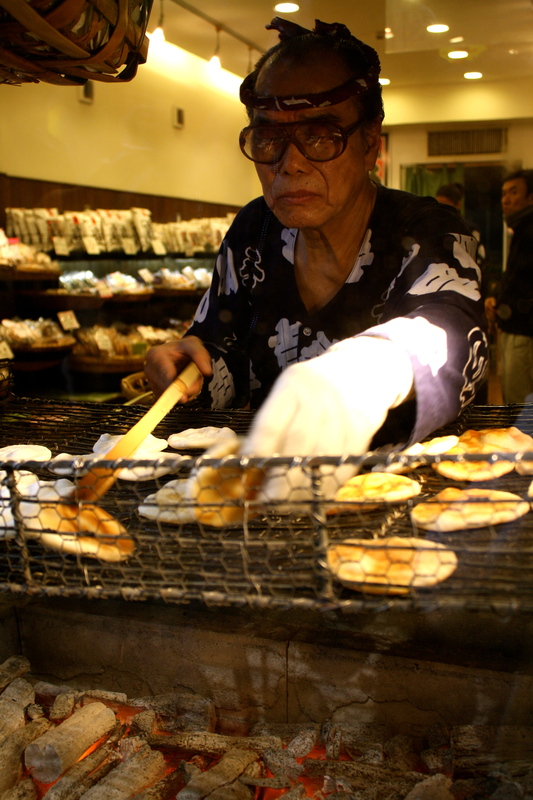 Rice crackers brushed with soy sauce are still hot when they’re handed off to waiting customers. 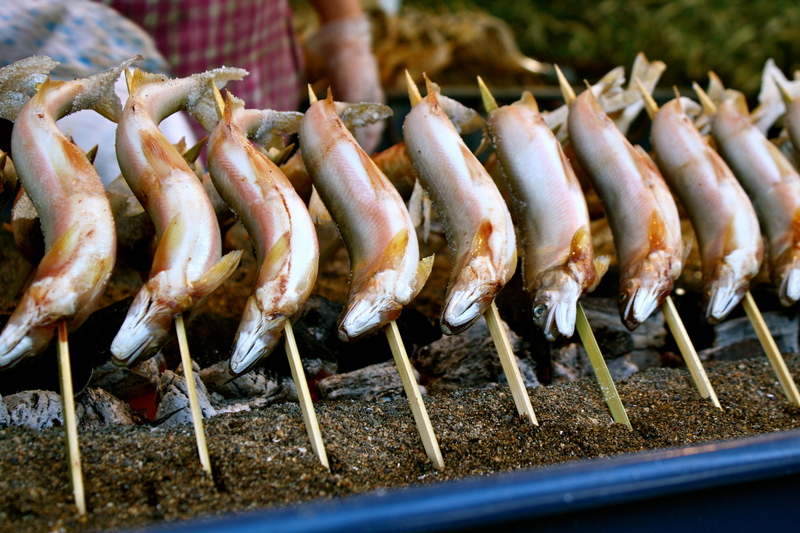 Grilled fish outside the Inari shrine in Kyoto. These birds gave off the most intoxicating sweet, smokey aroma as they sizzled over tiny outdoor grills. Unfortunately it was impossible to convince my husband to eat a tiny bird with the head still attached no matter how amazing they smelled. Maybe next time. Thanks for going for me since we couldn’t get away right now! I can smell the aromas. Glad you both got back safely. Happy New Year 2012! 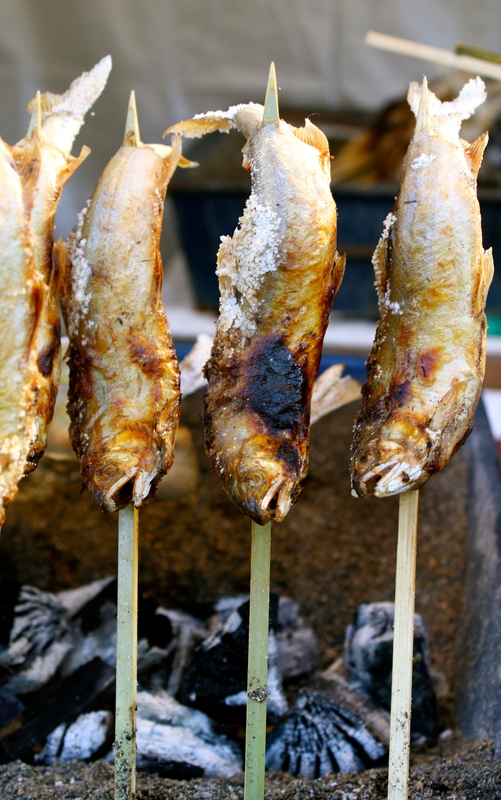 I miss street food so much! It’s one of my favorite things about traveling around Asia. They do it so well over there don’t they? I have a flight back to LAX on Jan 2, 2013 at 12:05 am from Haneda Airport, do you have any suggestions what I should do? Do you know if any shrines or temple near by the Airport? Also, how early do you suggest coming to the temples/shrine? Lucky you! Unfortunately, I don’t know of any great temples or shrines right by the airport. But Haneda is a lot closer to the city than Narita, so it would be feasible to visit the Meiji Shrine or Senso-ji temple in Akasaka, and just grab a cab out to the airport afterwards. I actually prefer visiting the shrines and temples later in the day, after the food vendors are up and running. They’re always beautiful at dusk as well as later in the night. It’s January 2nd so they’ll be packed… but that’s part of the fun!